It is copyright © Nicole Mauro and Jacket magazine 2010. See our [»»] Copyright notice. It’s hard to write with any certainty about stillness and location–how can something that exists everywhere have a singular location? — but the first thing I wrote in my notes on Roger Snell’s The Morning is ‘stillness and location’ followed by ‘!! !’ At some point during my reading and subsequent re-readings, I, with much enthusiasm, must have wanted to make note of the two, and so thought writing the two words on a slip of paper would make it easier for me to explain whatever my revelation was to you. Thematically, stillness and location exist in Snell’s work, but the task of explaining, of parsing, deconstructing, and breaking it down to demonstrate I get how it works so you will understand just isn’t going to work for this work. In part, that’s because I don’t get it. I can’t. A Snell lyric is elegant, static, concentrated, and, like the smallest measurement of time as far as humans have been reducing it, so dense and minute it can convert infinity into a mind-blowing yactosecond. The words are mostly monosyllables, which could clip the cadence and sound unnaturally staccato for what is otherwise an effortless description of a desire for otherness and solitude, except they don’t. Because Snell’s language is direct, familiar, and particularly placed in almost haiku-like arrangement, the tercets read as whole poems rather than lyric parts of a greater poetic whole. Though the effect is minimalist, it is not entirely accurate to call the poem, or the book, Minimalist, at least not exclusively. Like Williams, Olson, Creeley, and Duncan, who were more minimalist-esque than Minimalist, Snell is deftly reductive and sonic, his repetition of words and sounds inducing a hypnotic trans-body-space-time continuousness, and, like the aforementioned poets, his use of sound is base and basic, re-sensitizing those of us who struggle with the disquiet of modern life to the sound of pure sound. But I would argue that Snell is warmer, more interested in celebrating our everyday routines than cooly, detachedly perceiving them, and his lyrics are way more amusing (‘I’ve grown fatter/from not smoking, my/hair’s long & I’ve a beard/what does it matter?, 20). Snell is also more narrative, more serial. Every tercet in ‘The Morning’ concretizesone discrete moment, placing the reader in brief yet whole points in time with the time and space to examine the experience while moment simultaneously progresses until infinite,until,by extension, we understand in the larger sense our experiences are constructed of a series of distinct occurrences and observations that congregate into one unbreakable totality called ‘Experience.’ Snell moves this narrative with nimble enjambment. In slightly distancing singular words (like ‘so’) from the combinations and concepts they form with other words (like ‘so-called’), we focus on the parts as we understand the whole, and have the same experience as the narrator. We are in ‘some/other view’ filling ‘this so-/called/space’ while staying in our own heads and bodies. Being moved without moving embodies Celan’s notion of the metaphysical ‘still-here,’ of being (a part of) an undisturbed location where stasis is pause for reflection, a rare occasion where the reader, to borrow from Pound, sees the old made new, the ordinary strange and unexplored. ‘… either in’ the ‘head’/or outside of it (42).’ Celan appears as an epigraph to section Four of ‘The Morning,’ and I am including here the quote, in its entirety, to illustrate the trans/formative nature of Snell’s work. The still-here of the poem can only be found in the work of poets who do not forget that they speak from an angle of reflection which is their own existence, their own physical nature (61). To show stasis, an artist has, somehow, to affix a moment, whether to paper or canvas or stone, requiring a great deal of artistic skill to render accurately, if accuracy alone is the goal. It’s not, and so fragmentation and parataxis are often employed to interrupt, accelerate, or break apart moment to make it different. This makes for interesting reading, but often doesn’t, in my experience, do anything other than deconstruct. I don’t see anything new, just the old taken apart. There is no dismantling for the sake of dismantling with Snell. In ‘Aperture,’ for example, every poem, every line is a both absolute part and perfect whole. This quatrain, so simple in construction, and so much fun to say aloud, is Gordian in terms of density and complexity, culminating into a directive to remove space, and so presents something of a practical conundrum to the reader, implying, as it does, that space, which is everywhere, is a construct of the human head, existing in the mind but not outside it, rather only existing outside it because the mind conceives it should, not because it really, physically does, putting the mind in a Structuralist headlock of its own creation — the space out there, which is vast and overwhelming, somehow fits in the head. We can see that it is too big for us to see, but if it is, indeed, too big for us to see, then why can we see it? We can’t, what we’re really doing — what Snell illustrates so gracefully and purely — is using sight to conceive it. Eyes and ears are apertures without censors, they purely receive whereas the mind perceives. Because of this, eyes and ears, unlike the mind, cannot cognitively leak. They are ‘lines,’ showing to us the extent of extent, and though we have found ways both clever and destructive to outright avoid, or conveniently manipulate what we see and hear, it is we, and not our parts, who lie, and the body part that creates it is the same that believes it — I am of course talking about the elusive, grooved mollusk called ‘the mind,’ and it is both incredibly dumb and extraordinarily sly. I should after reading Snell not trust it with my own eyes. But anything that makes loneliness and glee, that inspires in us a staggering range of brilliance and idiocy, that makes us read and write poetry can’t be a bad thing. Snell likes the mind just fine, but he gives the eyes and ears more credit, more lyrical attention and time. After reading The Morning, I can say I do love eyes and ears, vision and voice, more, and his book too — for its unabashed lack of deceit, for having in those parts of ours a total belief. Nicole Mauro has published poems and criticism in numerous journals. She is the author of the chapbooks Odes (Sardines, 2003), Dispatch (co-authored with Marci Nelligan, Dusie, 2006), The Contortions (Dusie, 2007), and Tax-Dollar Super-Sonnet (Pendergast/Dusie, 2009). She is the co-editor of an interdisciplinary book about sidewalks titled Intersection: Sidewalks and Public Space (with Marci Nelligan, ChainArts, 2008). Her first full-length poetry collection, The Contortions, was just published by Dusie in 2009, and her second, Tax-Dollar Super-Sonnet Featuring Sarah Palin as Poet, is due out from Black Radish Books in 2010. 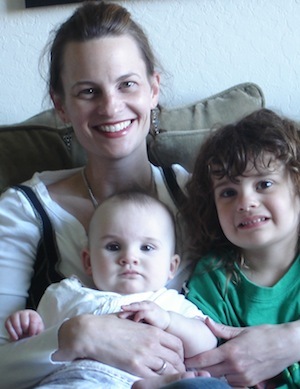 She lives in the San Francisco bay area with her husband Patrick, and daughters Nina and Faye. She teaches rhetoric and writing at the University of San Francisco.